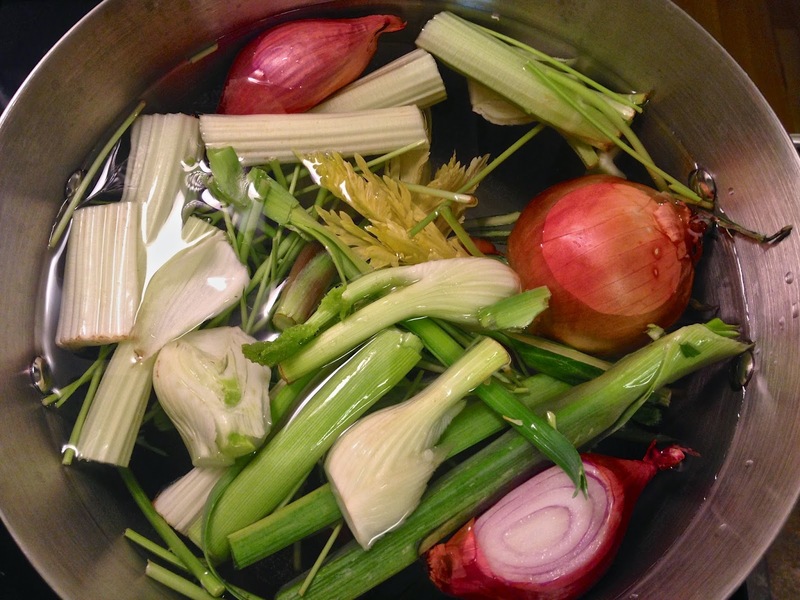 There's nothing like homemade stock. That boxed kind from the store is certainly useful, and can be a necessary evil, but it usually just makes me disappointed with its sad, dull and muted flavors. Of the store bought stocks I've often found that veg stock is the worst in terms of flavor. The brands wildly differ in taste, and some of them are just straight up bad. I think making stock seems daunting, but while it take a few hours of simmering it's pretty much one of the easiest things to make and the pay off is huge. The other bonus of stock is that it can utilize a lot of the odds and ends of veggies that you normally throw out (or compost?). I hate seeing bags of green things go into the trash. When I'm prepping veggies during the week, I keep a bag of trimmings and stuff I know I won't use: leek tops, cauliflower ends (not the leaves which are great to eat), carrot ends, parsley stems without the leaves, green onion roots, celery leaves, veggies that are a little wilted and past their prime. I keep a lot of those guys in one bag and at the end of the week I fill a pot with water and dump the veggies into the pot. I also usually add a few whole onions or shallots with the skin still on too. Onion skin gives stocks a lovely rich brown color. Basically, stock is about throwing a bunch of stuff in a pot, letting it simmer in a lot of water for hours, or until the stock reduces by half so that the flavor gets concentrated and yummy, and then you strain it using a mesh strainer (or cheese cloth if you're fancy). Once the stock is done, I store some in the fridge for immediate use, but I also like to keep mine in pint size freezer-safe glass mason jars labeled with the type of stock and the date. Then I take them out and defrost as necessary. Stock keeps for about 3-4 months in the freezer and about 1 week in the fridge. Also, while you're making stock, if there are some veggies you want to blanch that day, you can throw them into the pot too. They'll add extra flavor to the stock, and the stock will add extra flavor to them. It's a win a win for all the veggies involved (see pic of cabbage below). Fill a large stock pot with water (at least 3 quarts/12 cups). Throw all of your vegetables into the pot. Bring the liquid to a boil, reduce the heat and simmer for 1.5-2 hours, or until the liquid reduces by half. Once simmered and reduced, strain the stock through a fine-meshed sieve, or a cheesecloth-lined sieve. Use immediately or store for later use. Such a great idea! I didn't know about leaving onion skins on.